The Honda Goldwing GL1800 provides a place in the rear trunk for the factory Hondaline CD changer. The CD changer is an older technology mechanical device that is rather pricy at $700. The Goldwing does offer a 3.5mm audio jack in the fairing left front pocket that you can use for interfacing any audio source which for many is an inexpensive solution to listening to your choice of music or audio books while driving down the road. The article will introduce you to other options for you to install affordable audio sources in your GL1800 using music available on your Microsoft Windows PC or Apple computer. The key to these devices is that they interface with the Goldwing's CD changer controls on the handlebars allowing you to change song tracks and CD volumes while riding down the highway. GL1800 Hondaline CD Player Six discs are loaded and unloaded individually. CD Changer Unit mounts inside a specifically designed compartment within the trunk. Integrated six disc CD Changer Unit is designed to meet the stringent engineering standards Honda has become famous for, providing hours of digital sound and quality. The 2012 Goldwing is upgrading it's Premium Surround Audio system with XM radio with navigation, traffic and weather. 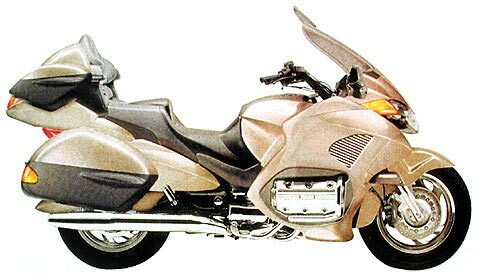 The Goldwing motorcycle advertises the capability to interface an iPod or USB memory device via an interface cable in the rear trunk. Haven't seen the manual for this yet, but if it is like the Honda Civic factory audio system, it will play MP3, WMA and ACC format music files. It will use the handle bar controls to switch folders and also provide additional features like random play, search and repeat. If you can't decide between the Soundgate, BikeMP3 or J&M players, I recommend the 2012 Goldwing upgrade. BikeMP3 GL1800 Digital Music Player is an upgraded version of the older MP3 solution for the Honda Goldwing. This new unit addresses the pitfalls of older solutions as well as offering the most requested additional features. Song Populating Software works with any of today's popular digital players such as BikeMP3, J&M, etc. The BikeMP3 delivers CD-quality sound directly into the factory sound system via the CD changer port, no loss of sound quality that can occur with existing solutions. Directly control the unit from your bike audio controls, the user only needs to insert a SD card or USB stick up to 8G, then your set to enjoy digital music (MP3/WMA) on your bike. 2-year warranty. New JM Bluetooth Digital Music Player plugs directly into the CD selected music input plug on all 2001-2010 Honda Gold Wing audio systems, replacing the Honda CD changer, at a fraction of the cost. Store and play up to 884 MP3 song tracks from your music library on a single SD card, (exact # of song track storage and playback will vary depending on model year of the GL-1800) and toggle thru song after song using your existing handlebar audio system controls. Plug in your iPod® with your favorite music files stored, and toggle thru song after song using your existing handlebar audio system controls, without discharging your iPod’s internal battery. Plug in your remote mounted Satellite radio receiver or MP3 player, using the 3.5mm 3-conductor plug accessory cable and enjoy high-quality stereo music thru the Honda audio system CD selection. Link by Bluetooth® your cell phone or Garmin® Zumo to the player and your cell phone conversations or navigation commands will automatically prioritize OVER whichever music files are being played at the time, allowing hands free cell phone conversations, by both the driver and passenger thru their J&M brand helmet headsets. If your cell phone/smart phone also contains stored stereo music files, they will stream via Bluetooth, into the music player and on thru to the GL-1800 audio system. 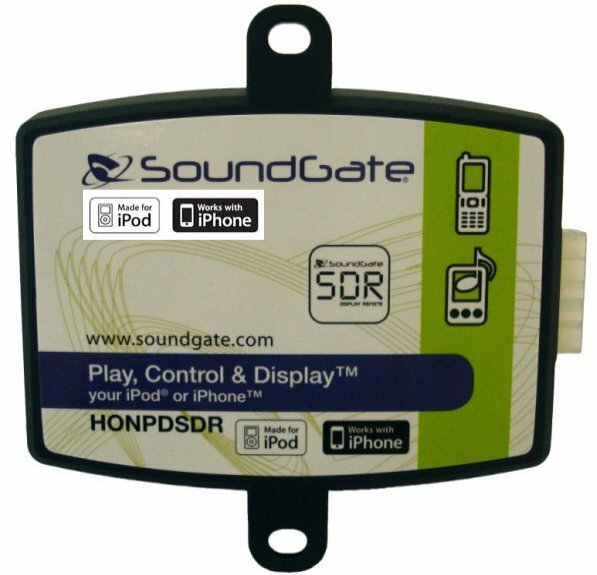 Soundgate Honda Goldwing GL1800 HONPDSDR Plug-N-Play Interface easily connects Apple® iPod®, iPhone™ and original iPod nano® into your existing GL1800 factory CD player plug under seat. Provides up/down remote control of songs and playlists thru factory handlebar radio controls and dash display. Pre-set iPod/iPhone manually to playlist, artist or songs and control playing up and down in that selected mode with unlimited songs. Interface charges your Apple device and pauses music when switching to and from AM/FM factory radio. SDR mode allows selections directly from your iPod or factory radio handlebar controls for the ultimate iPod experience. Includes 6ft connect cord so iPod device can be stored in fairing pocket, rear trunk or anywhere on bike. Information coming from the iPod or iPhone will resemble the CD text seen when an actual factory Honda CD changer is installed. Safely charges all iPod and iPhone devices. 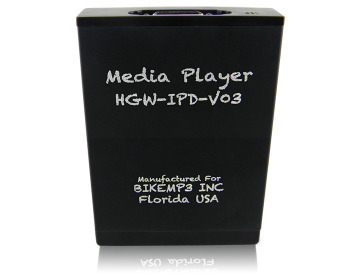 Works with most internet radio apps on iPhone® devices. Easily connects directly into factory Gold Wing CD changer plug under seat and is Plug-N-Play. The following table shows a comparison between the different music player products. The iPod and iPhone interfaces to the player via a USB cable interface. The Music Player Software offered only by Wingstuff allows the user to control the play order for the BikeMP3 and J&M players, otherwise the play order is determined by either the file name or load order for the USB or SD memory device. The Honda display is only capable of displaying a single-digit CD volume (0 to 9) It also only displays Tracks numbered 1 to 99. Some players allow the user to overload the number of volumes and tracks, but it's a guessing game as to the actual CD volume and song track being played.